Another thing that caught my attention was how rapidly the carbonation bubbles left my soft drink while we were having a meal in the revolving restaurant at the top of the Schilthorn in Switzerland (elevation 9,744 feet). This is where the James Bond movie “On Her Majesty’s Secret Service” was filmed and the pop was to wash down my “James Bond Burger”. So what do these two things have in common, other than proving that maybe I need to get out a bit more often? Basically, it all has to do with changes in atmospheric pressure. Let’s start by imagining that you are seated at a table at mean sea level. This is the average between high tide and low tide. Now, picture a one-inch square on the surface of the table. There is a column of air going from this square inch area all the way up to the limits of the Earth’s atmosphere. That column of air weighs 14.7 pounds. Therefore, we can say that normal atmospheric pressure is equal to 14.7 pounds per square inch at mean sea level. My apologies to those who have totally embraced the metric system, but it is much easier to discuss pounds per square inch than to explain things using units of kiloPascals. When products like the yoghurt or coffee creamers are packaged at low elevations, the pressure inside the containers is balanced with the air pressure on the outside of the container. The pressure is about 14.7 pounds per square inch, or 14.7 psi. At these elevations, the foil closures on top of these packages are flat. The packages of snacks may be slightly puffed up, but definitely not to the extent that they are on the plane. In a typical commercial airliner, the cabin pressure is maintained at what would be found at an elevation of about 8,000 feet. This means the actual pressure is around 10.9 pounds per square inch. Keep in mind that the pressure inside the sealed packages and containers is around 14.7 psi, which is appreciably higher than that on the outside. Therefore, the air trapped inside expands, and the containers puff up. In the revolving restaurant at the top of the Schilthorn, the atmospheric pressure is about 10.2 psi. This pressure is just over two-thirds of the atmospheric pressure pushing downwards on surfaces at sea level. As a result, the small bubbles of carbonation in my drink were able to break free more easily than at sea level, and my drink went flat very soon after it was poured. Of course, it didn’t help matters that the server poured it straight into the glass, rather than running it down the side to prevent excessive fizzing. Reductions in pressure due to changes in elevation also have other effects which may not be so obvious. At elevations of 10,000 feet, water boils at only 89.6 degrees Celsius. Even at elevations of 5,280 feet (one mile) water boils at 94.4 degrees Celsius. These are major differences from the 100 degree Celsius boiling point of water at sea level. There can be pronounced effects on things like baking a cake. As a result, manufacturers of cake mixes sometimes have special notes on the boxes for anyone preparing their product at higher elevations. The adjustments may be as simple as adding a bit more water to account for the extra losses during baking. On the flip side of all this, we can use pressure cookers in processing applications to increase the temperature at which water boils. By raising the pressure inside the cooking chamber, temperatures of 121 degrees Celsius can be achieved. This is well above the normal boiling point of water. These high temperatures are important for reducing levels of microorganisms in canned foods. 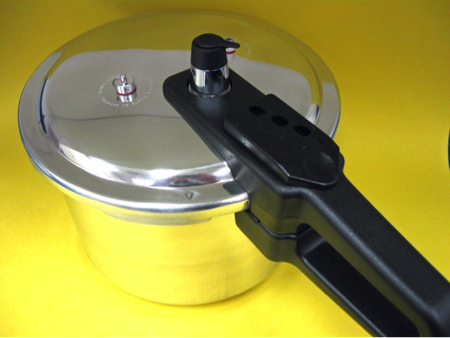 Care should be taken when working with pressure cookers. Changes in weather can also produce changes in atmospheric pressure. “Low pressure” is usually an indication of stormy weather. Along with the lower pressures comes a corresponding expansion in the volume of liquids and gases that are trapped in air-tight containers, This is how some people are able to tell that weather changes are approaching since they can feel it in their joints. As the atmospheric pressure decreases, fluids and tissues in the joints may expand, causing pain to develop. Even though atmospheric pressure is all around us and may be taken for granted, it can have some significant effects on our lives. The next time someone comments that the weather is changing because they can feel it in their bones, you might not want to dismiss things so casually.